In Phoenix, AZ, Chad and I visited artist Monica Aissa Martinez. 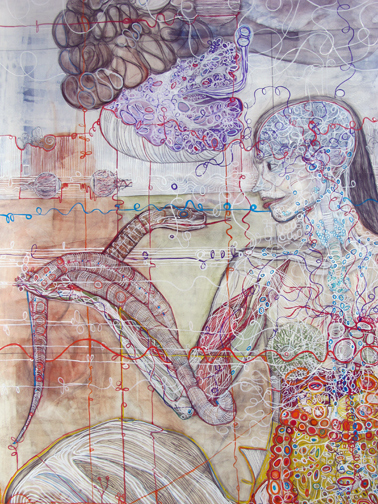 Her large, richly detailed and colorful paintings begin with the anatomical structure of the human body, but manage to fold in the artist's love of the maps collected by her grandfather, her own study of yoga, her heritage as a Hispanic woman and a holistic approach to mind, body and spirit that incorporates both the cosmic and the micro-cellular. 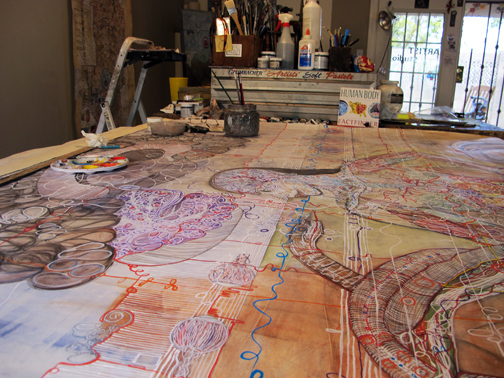 The mixed-media works are created in a lengthy process that can take a year or more to complete. Each work begins with an anatomical drawing, and then Martinez begins layering in additional elements. With each layer, the character of the work changes, as can be seen in her photos of some of the works at various states of completion. 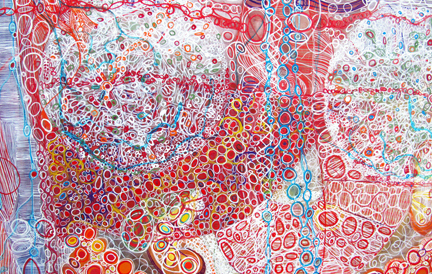 At one level there are rich organic shapes representing organs; at another, there are lines suggesting the circulation of blood through the veins. Next, the work is colonized by colorful shapes, evoking cells, and textural striations that combine the literal physicality of muscle tissue with a powerful sense of movement and connection between the forms. Viewed up close, the works are abstractions of vibrant color and shape. But pull back, and they become elegant iterations of Martinez's holistic interpretation of the world and her place in it. Every time I come to my work, I ask myself three questions: Who am I? What am I? What is this world and my relationship to it? I'm trying to start a dialogue to answer those questions through my work. Crystal Bridges Museum of American Art President Don Bacigalupi and curator Chad Alligood have been traveling the country for more than six months, visiting the studios of more than 700 artists in preparation for a major exhibition of contemporary American art titled State of the Art: Discovering American Art Now, to open at Crystal Bridges in September, 2014. The exhibition will showcase the work of more than 100 artists from every region of the United States, and will offer an unusually diverse and nuanced look at today's American culture. The goal of the exhibition is to inspire conversation, broaden perspective and facilitate dialogue on the issues most important to us -- as a nation, as artists and as a world. Additional information about State of the Art, including weekly profiles of some of the artists the team have visited, is available on the Crystal Bridges blog.